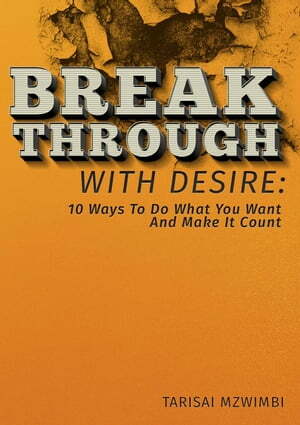 Collins Booksellers - Breakthrough With Desire: 10 Ways To Do What You Want And Make It Coiunt by Tarisai Mzwimbi, 9781540137210. Buy this book online. Have you had a hard time being disciplined and found yourself constantly changing your goals and dreams? Breakthrough With Desire: 10 Ways To Do What You Want And Make It Count is a guide you can follow and remind you of the importance of staying focused. The major problem most people face in the pursuit of their ambition is not having a strong enough reason for it in the first place. After you read “Breakthrough With Desire: 10 Ways To Do What You Want And Make It Count,” you will have a good understanding of the value of having a strong resolve for your passion by ultimately answering the “why” question. All you have to do is read the book and start a new path to a fulfilled life, doing what you want, essentially what you love, and making every second count. had a hard time being disciplined and found yourself constantly changing your goals and dreams?